Picasa is online web album from Google where one can store different types of files for purpose of sharing with friends, email and using it into website/blog. Photos: .jpeg, .tif, .tiff, .bmp, .gif, .psd (Photoshop), .png, .tga, and selected RAW formats. For general playback in Picasa: .mpg, .mod, .mmv, .tod, .wmv, .asf, .avi, .divx, .mov, .m4v, .3gp, .3g2, .mp4, .m2t, .m2ts, .mts, .mkv. For several of these file types, the correct software is required for playback. Read more about video file support. 1. Open account in Google Picasa. 3. Press “Upload”. Then Album selection window will popup. 4. Give name for a new Album or select from old one [give visibility as “Public on web” to properly appear in search engine]. 5. Then click on Continue. 6. Add proper Caption(description) about image to properly appear in search engine. 7. Go to the required album. 8. Click on required image. 9. Click on "Link to this Photo (1)" in right side panel. 10. Tick on "Image only link (2)". 11. Select image size (3). 12. Now your required link is under "Embed image (4)" copy and paste into webpage or blog. 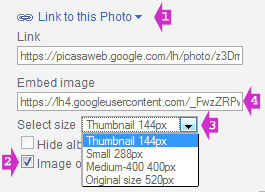 For hosting videos in Picasa for Website or Blog follow same steps as for images to get the link.